WILLIAMS MEDIA talks with the man who helped to put Bali well and truly on the world's gastronomic map and still a major player in the island's tourism industry. Chris Salans, Bali's first multi-award winning celebrity chef. 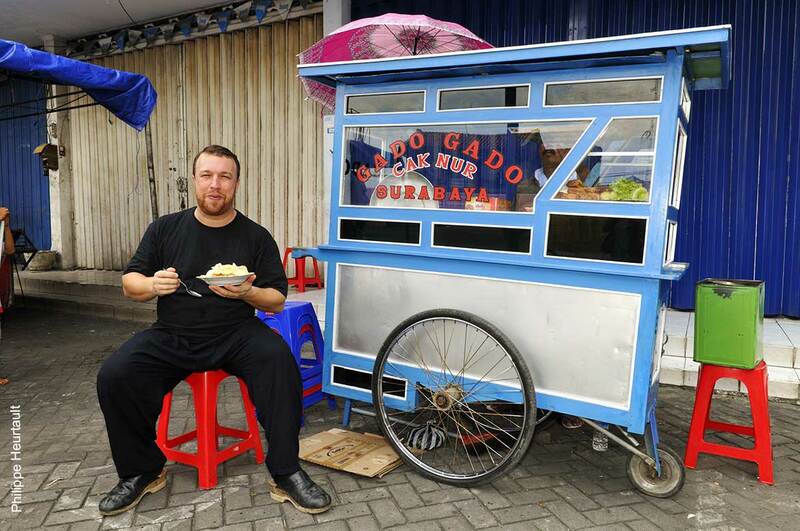 Chris enjoying a traditional Indonesian Gado Gado, served local style. Private cooking class in The Workshop at Mozaic in Ubud. Spice by Chris Salans in Bali's cultural capital of Ubud. We have to thank The Legian Hotel in Seminyak for bringing Chris Salans to Bali from New York in 1995. Once here his interest in Asian ingredients and his love of classical western methodologies led him to create two iconic and award winning Bali-based restaurants; firstly Mozaic in Ubud 2001 and later Spice by Chris Salans in Ubud and Sanur in 2015. Chris is also a significant player in Bali's tourism scene and is credited with being one of Bali’s top culinary ambassadors promoting the island as a foodie destination. We managed to peel him away from his creative kitchens and between overseas trips to share some insights with us about his business and his take on investing in Bali. Why did you choose Ubud as the location for Mozaic and Spice? When I was first playing around with the idea, there was nothing quite like 'Mozaic' in Bali; French cuisine and Indonesian flavors working together. It worked and I thought the concept needed a refined, high-spending audience that better understood what I was trying to do because this type of dining was all about the chef being king, not the customer! It was about creating a destination dining experience and that worked best with the well-travelled clientele that were attracted to Bali's cultural capital of Ubud. What developments have you seen in the local restaurant scene in the time you've been here in Ubud and elsewhere? Oh my god! That’s a long one to answer. When I first came to Bali there were no independent restaurants, they were all in hotels and everyone was basically importing everything from abroad and cooking western food. When I saw this, the first thing I did was to forage the landscapes of Bali to discover a multitude of great produce from the oceans, the lakes, the farms and the forests. And I found it! In those early days all the guidebooks would say you've got to be careful when you eat out: Don’t eat this! Don’t eat that! Now, it's so different because they're all raving about how great the food is in Bali and it's a scene that's mostly happening in independent restaurants. Everyone seems to be focusing on local produce and flavors, which is great! A lot of chefs in Bali say that I have paved the road for them and I’m proud to have done that for them and for the island. Would you agree that Bali seems to have become a 'foodies' paradise? Yes I would. And I think it will continue to be so, but because tourism to Bali is seeing a shift towards more of a mass market with less purchasing power this will make it difficult for 'foodie' restaurants to become mainstream. But I guess you only need a few of them to make Bali a 'foodie' paradise. Personally, I feel there's a lot more happening in the 'foodie' scene in Ubud than anywhere else in Bali. We have fewer restaurants there but more of them are high quality or value for money. This has probably happened because of two key things; a) there's still a better quality clientele in Ubud as it was when I first did my research 18 years ago before I opened Mozaic and b) because Seminyak, Kuta, and Legian are saturated and overpriced. Where do you see Bali's food industry going in the next 5 years? I can’t tell where it will go really, but personally I hope more Indonesians set up shop and start promoting their own cuisines and flavors. Too many expatriate chefs currently run the market and this has to change so that Bali, and Indonesia in general, develop a strong local signature. F&B is a very competitive industry in Bali. It seems a lot of restaurants come and go. That's right it is very competitive in Bali. A lot of areas are now saturated with restaurants. Unfortunately, this means the clientele’s purchasing power is going down and that leads to a price war so only the very best survive. It's tough. What pointers could you give to someone just starting out? How important is location? My advice would be that whatever business you do make sure you have a strong concept with an active market and make sure you have at least 6 months of working capital. Bali is seasonal, so depending on your market opening at the right time of the year could have an effect on your cash flow so be aware of this as well. Depending on the F&B concept you want to develop location can certainly be important. As a destination restaurant, location is not always important but if you are one-in-a-million then location will make all the difference. Is now a good time to be investing in a business in Bali? I think there are too many uncontrollable factors in Indonesia in general to confirm a statement like that, but for those who are looking for long-term investments, Bali is good at any time. My biggest concerns for the long term though, are traffic and trash. There's too much of both and I don’t see anyone doing anything serious about either. These could become huge problems for Bali if is nothing's done about it soon. What's the value proposition people are looking for? Well there's a little of everything. There's one market wanting it cheap, cheap, cheap. This covers mass tourism on tours as well as youngsters, back packers and the like. This represents quite a big percentage of the overall market. Then there's the middle segment, which has money and is looking for trendy and fun. So for them it’s all about value for money and concepts. Then there are the high-end players who are looking for more unique, luxury experiences. This is real niche because these guys are well travelled and they know what they want and what they like. And that means you have to offer something out of the ordinary to please them. Are you seeing more eco-friendly businesses opening in Bali? Yes, there are eco-friendly options in both architecture and food offerings, with sustainable concepts, more vegetarian and more vegan concepts. The only thing I don’t know is whether or not their sewage and waste management systems are eco-friendly or not?! Bali has seen a lot of changes in terms of tourism and development in the last few years. What aspects of this have you embraced? Well we've certainly embraced the change in tourism. I don’t think any of us really has a choice in that! But generally I think tourism has unfortunately not developed for the better. We simply accept the changes and move on. 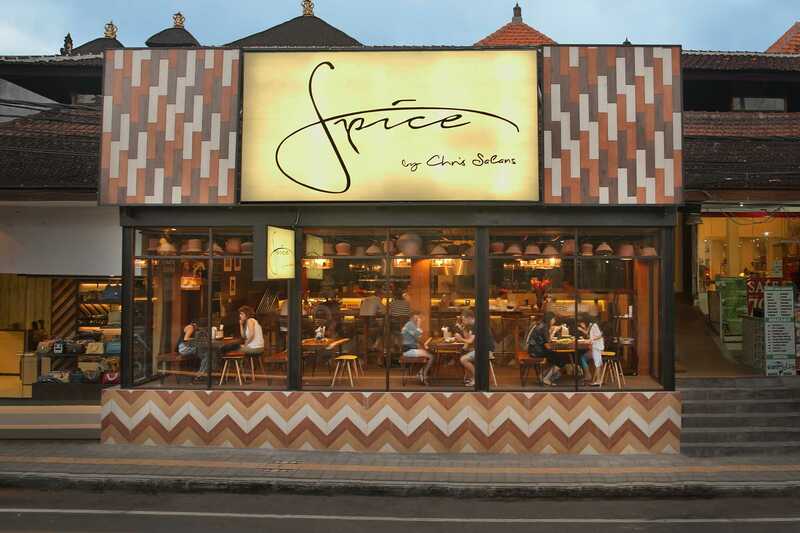 Spice by Chris Salans, my new Gastro Bar concept, was created primarily to supply the change we were experiencing, especially in Indonesian tourism. We saw more and more middle class Indonesians who wanted to eat trendy food at affordable prices and who traveled to Bali to do it. So, we took the flavors of Mozaic, stopped importing (we have a no import policy at Spice on foods) and created a fun modern version of really homegrown Indonesian cuisine. It's proven to work really well and more than 50% of our clientele is now Indonesian. How are you promoting Bali as a destination? I'm always promoting Bali and Indonesia. 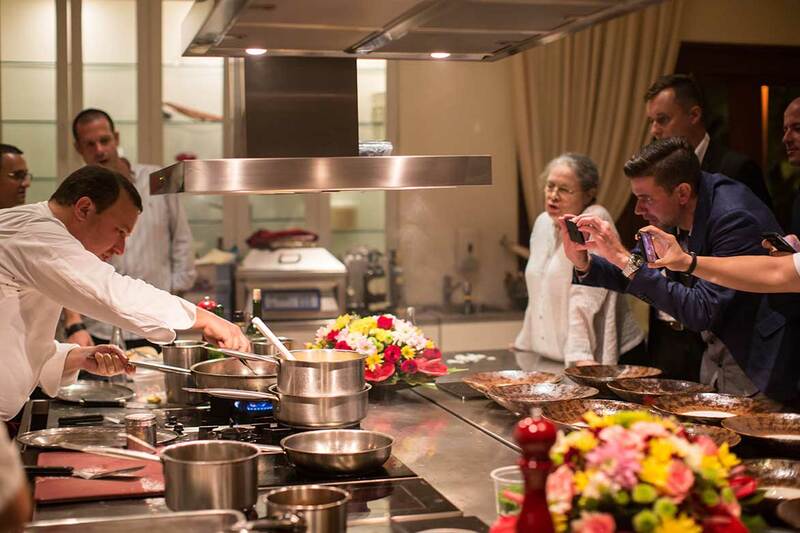 I'm very active with guest chef events outside of Bali; I have Jakarta and China next month and several events abroad in the pipeline including Marrakesh. I went to Singapore last month to pick up Mozaic’s award as Best Restaurant of the Year 2018. TV-wise we’re in discussion with Iron Chef Thailand to do an Indonesia versus Thailand Iron Chef battle! All of this I do with my suitcases filled with local products like kluwek, torch ginger flower, and other wonderful Indonesian produce, which is the key to my success. Which part of Bali do you live in? And why did you choose that area? I live in Sanur. It's a central location for my businesses and it's also close to schools and other necessities for my family. There are quite a few good places to eat well in Sanur ranging from warungs to restaurants. I will mention one of each – say Warung Mak Beng, Kafe Batujimbar and as a restaurant, Arena. But there's also great Italian, Indian, Japanese and other food options in Sanur. Learn more about Chris and his award-winning culinary destinations by clicking here for Mozaic and here for Spice by Chris Salans. Chris has been selected as Garuda Indonesia's Star Chef and as of September 2017, the flavors of Spice are being featured on Garuda Indonesia Airlines' Business Class routes to Melbourne and Shanghai.